■ Retrograde injection of methylene blue via the ureteral catheter may demonstrate bluish discoloration of the diverticulum. The laparoscopic cyst-aspiration needle can be useful to probe the suspected area of the diverticulum. 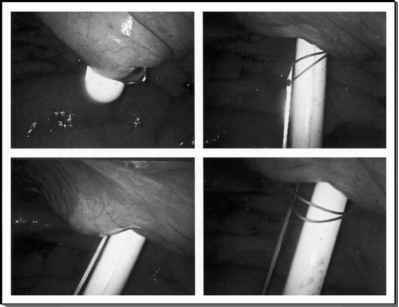 Intraoperative laparoscopic ultrasound allows for precise three-dimensional localization of the diverticulum (Fig. 2). If this is not available, fluoroscopy via C-arm device may be necessary, albeit cumbersome, because the kidney is positioned at the break or post of the operating table. Cross-table lateral and oblique views will be necessary. In the absence of a radiopaque calculus, retrograde injection of diluted contrast material may be necessary as well.